The weather the night before was gale force winds and some thunder storms. However the weather pulled through and turned out perfect in Ohope for lawn bowls. Tauranga Boys College Anthony Quellet taking the gold and the trophy and displayed calmness and skill as he had a great day on the greens scoring very high. In the girls singles Victoria Brown-Reube taking the gold and trophy displaying some fantastic skill with her precise aim towards the jack. The pairs was jammed packed with action and came down to some close ends at the end of the day. 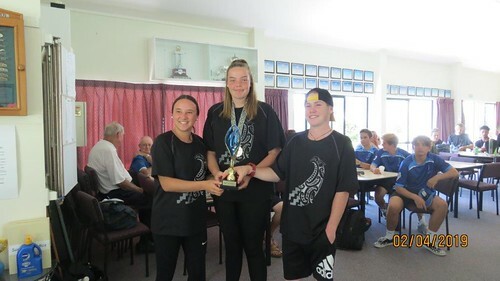 Whakatane High School taking out the boys trophy and Reporoa College taking out the girls pairs. Teams event which was a new event this year. The team work displayed by all teams was exceptional spectators witnessed so much fun and laughter at the greens. Power plays were involved at such crucial times , all schools competed for the trophy. Reporoa College taking out the first event teams event. Thank you to Ohope Bowling Club -Gary and his wonderful team of volunteers without you guys bowls would not happen in secondary schools. Special mention to my wonderful helpers Lisa Edgecumbe College and Trident High School Tracey for all the photos supplied.